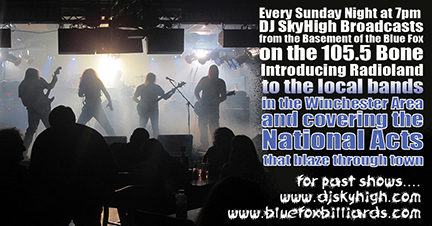 Every Sunday at 7pm on 105.5 The Bone through out 2013, DJ Skyhigh had a half hour show sponsored by the Blue Fox. 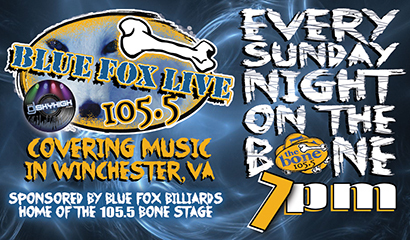 It showcased the Blue Fox's entertainment schedule and the bands that played at the Blue Fox. It was the beginning of the new stage at the venue. It was sponsored out to the company that owns 92.5 WINC. Originally this was one of the last locally owned station with a very large bandwith and tower. The family recently sold to a New York based company. 105.5 was a great station. It played the best of Rock & Roll, Heavy Metal and the new rock. It was an honor to negotiate the deal for my own show and it has convinced me to do another, longer and better one. The Bone switched to country format. Myself and a very few knew for a few weeks to months. The program director of a competing station showed me the numbers. They were bad. but all of my commercials for the venue and my own personal commercials. I thought it was a lil crazy that everytime I got in the car. I would hear them.....WHY because they had no advertisers. Anyway it took a few months of testing and trying to get a format that all were happy with. We went on the air 3 months late so we only produced 21 shows. Conrad & John at the Blue Fox built a small corner of the basement into a makeshift studio. I brought in the equipment and I began to ask the bands to come. Everyone I talked to was down. I would schedule around their time or come up after they soundchecked and get them into the basement for an interview. As soon as the bands started getting bigger. The station shut down. Each show features a 3 part interview and 3 to 4 songs from the band. Below is a collection of the shows. At the very end. I started putting them up on youtube to a slide show. They are also featured.